Looking for a guide for a first-time visitor to Amsterdam Schiphol Airport, The Netherlands? Search no more! Are you a first-time traveller to Schiphol airport and am looking for all information about Amsterdam Schiphol Airport in The Netherlands that you have to know? Search no more! Do you want to know how long it takes you from Amsterdam Airport to the city? Which terminals there are and much more? Continue reading for all the information about Amsterdam Schiphol Airport that you as a first-time traveller to Schiphol need. Amsterdam Schiphol Airport is the most important airport in The Netherlands and the airport with intercontinental flights. Amsterdam Schiphol Airport is also the most convenient airport to Amsterdam. Amsterdam Schiphol Airport is also known as Schiphol Airport, Amsterdam Schiphol or Amsterdam Airport. It is located around 15km South West of Amsterdam, in the province of Noord-Holland. Amsterdam Schiphol Airport is the only airport in Amsterdam. The Amsterdam airport code in AMS (IATA) or EHAM (ICAO). Schiphol airport is the third most trafficked airport in Europe, after Heathrow (London) and Charles de Gaulle (Paris). Most important airlines: In total 89 airlines operate to and from Amsterdam Schiphol Airport. The ten airlines that fly most to and from Amsterdam Schiphol are KLM Royal Dutch Airlines (hub), EasyJet, Transavia, Flybe, Delta Airlines, Air France, British Airways, TUIfly, Vueling, and Lufthansa. During the normal weekdays, the peak time is between 10:00-12:00. However, you have to know that during the holidays the crowds can get insane. In general Friday & Saturday are the most popular dates for departures. But always check on the website of Schiphol Airport to be sure. You can see their prediction of the crowds for two weeks in advance. May holiday 28th of April – 6th of May (keep in mind that King’s Day is on the 27th of April as well, more about that here). Summer holidays start from the 7th of August and end on the 2nd of September. 1st of July, 6th, and 7th of August, 10th -15th of August, 18, 20 and 25th of August and 1st and 3rd of September. Schiphol Amsterdam Airport is open 24/7. However, between 00:00 and 04:00 Schiphol Plaza and the departure and arrival terminals are only accessible to travellers, staff, and people who pick up someone. You can find information desks at Schiphol Airport in the departure and arrival halls. You should go there if you’ve lost an item. Found items can be handed in here on the same day. The next day these items are collected and stored in the storage facility. Identification documents are collected and handed over to the Royal Netherlands Marchaussee the next day. The emergency documents office can be found in Departures hall 1. The number of shops at Amsterdam Airport Schiphol can be overwhelming for first-time travellers to Schiphol Airport, The Netherlands. Don’t worry, this guide will help you out. Amsterdam Airport Schiphol houses more than 200 shops and catering services. Schiphol Plaza is the shopping centre of airport Schiphol. The shops open, in general, 7 days a week from 07:00-22:00. At least a few shops and catering services open an hour before the first flight and close after the last flight leaves. Departures 1: Airlines such as Transavia, etc. Departures 2: At departures 2 you can find KLM and Sky Team flights at Amsterdam Schiphol Airport. Occasionally, you will see other airlines here. Departures 3: Departures 3 is for most non-Schengen flights. You will find low-cost airlines that depart from gates H and M in the back of departures 3, around desk 30. Pier B, C, D (second floor: gates D59 and higher) and M are used for flights to the Schengen countries. Pier D (first floor: gates D1-D59, E, F, G, and H are used for the flight to non-Schengen countries. Gates H and M are also known as the low-cost gates. They for the same pier (H/M) where the H part of the pier is a non-Schengen part and M is the Schengen part. Amsterdam Schiphol Airport has a lot of facilities, so to make it easier for you when you travel to Schiphol you can use this traveller guide to Amsterdam Airport. Amsterdam Airport Schiphol houses more than 200 shops and catering services. Schiphol Plaza is the shopping centre of airport Schiphol. The shops open 7 days a week from 07:00-22:00. Some open 24/7. Everyone who is in the possession of a boarding pass can shop duty-free in the lounges and at the piers. The designer stores and See-Flyshops at the piers and lounges open every day at least one hour before the first flight and closes after the last flight. Travelers with a destination within Europe will be taxed on tobacco and alcohol. Some catering services are open 24 hours a day, including two hotels. You will find ten smoking rooms at Schiphol Airport. Besides that, you can find wellness services and you can even find a Holland Casino at Schiphol airport. At Schiphol Airport they also have a collection and several exhibits from the Rijksmuseum Amsterdam, which you can find just past airport security. Amsterdam Schiphol Airport is the only airport in the world that has a museum in a terminal. There is also an Airport Library, where there are books and iPads that you can use. One other place you need to visit in Amsterdam Schiphol Airport is the Nemo science centre. While some might say it’s only for kids, I highly disagree. There is a meditation centre for everyone who needs a quiet space, a massage shop where licensed massage therapists will bring you back to life and a lot of stores such as H&M and Rituals to shop from at Schiphol Plaza. You can even get married at Schiphol Airport! But if marriage is a bit much, or you’re not interested in that, there is also a spa that you can visit which is called XpresSpa. Or spot airplanes at the rooftop terrace. There are plenty of things to do at Schiphol Airport. You can find ATMs at several places in Amsterdam Airport. A few can be found before and after security. You can store your luggage in a baggage depot between arrivals 1 and arrivals 2. This is open 24/7. There used to be baggage lockers at Schiphol Airport, but now you can only place your baggage at the baggage depot. The price starts at 6 euros a day for the smallest luggage. You are only able to pay by debit or credit card for the fee. Have a look at this link for more information. Free Wi-Fi is available at Amsterdam Schiphol Airport. It renews every hour. There is also the option for faster internet, but you’d have to pay for that. Note: This part of the article has affiliate links. This means that I will get a fee when you book through my link, this doesn’t mean that the price of the hotel increases. This is not the case. Schiphol Airport also has hotels that you can stay in. So, if you’re in need for a shower, a bed or don’t want to go into the city centre of Amsterdam for a hotel, you should book a hotel at Schiphol Airport. Sheraton, Hilton, and CitizenM hotels are located within the airport site, the former two having covered access to the terminal building. Plus, the Yote and Mercure are located within the terminal building. There are three hotels that are located within the airport site of Schiphol. Sheraton, click here for the current prices. Hilton, click here for the current prices. The next two hotels are located within the terminal building. Yotelair, click here for the current prices. Mercure Hotel, click here for the current prices. There are several modes of public transportation available at Amsterdam Schiphol Airport, such as buses and trains. There are also plenty of taxis available. Taxis at Amsterdam Schiphol Airport and how to not get scammed! When you want to take a taxi from Amsterdam Schiphol Airport, DON’T follow someone into a parking garage. ALWAYS walk to the yellow signs that say, ‘Official Taxi Stand’. Tourists have been scammed by some taxi drivers because they didn’t get into the line but instead followed a scammer. When someone wants to take you to the parking garage, get away. They want to and will scam you. People have been forced to give 900 euros for a twenty- minute drive. The good cab drivers are the ones that wait at the ‘Official Taxi Stand’. From Schiphol Airport to the centre of Amsterdam is around 50 euros in total. Not per person and you shouldn’t need to pay extra for your luggage. The scammers will tell you that it’s 40 euros, but once you arrive at your destination it’s suddenly 40 euros per person and you have to pay for your luggage. Always get a printed receipt. Don’t accept a handwritten one. The scammers at Schiphol Airport usually give you something that says TCA (Taxi Centrale Amsterdam). But they do NOT belong to this agency. So, if you’re going to complain, TCA cannot do anything as those cab drivers are scammers and do not drive for TCA. So, what have we learned? Always walk to the Official Taxi Stand, no matter what anyone tells you. Schiphol train station is underneath the airport terminal where it is a 15-minute journey into Amsterdam. There are also intercity trains to a lot of directions in The Netherlands. Check ns.nl to see to which trains you to need to take to your destination within The Netherlands. There are also fast, international trains that run to Brussels, Dusseldorf, Paris, Lille, Antwerp, and Frankfurt. During the night there are hourly trains from Amsterdam Centraal to Schiphol Airport. But always check ns.nl for the current timetable and for any changes. You need to reserve train tickets for the fast trains from Amsterdam Schiphol to other countries. If you’re taking sprinter trains or intercity trains within The Netherlands you don’t have to reserve and can grab a ticket from the machine or buy an OV Chip Kaart from a kiosk. The OV Chip Kaart is a card that is used throughout The Netherlands for every form of public transportation you can think of. Top op the card and check in and out when you travel. A number of bus services are also available at Schiphol Airport. There is a fast bus to and from Haarlem and plenty of more services including shuttle buses. Have a look at 9292.nl to see which bus you should take from Amsterdam Schiphol Airport to the centre of Amsterdam. Airport map of Schiphol Airport, click here. Departures from Amsterdam Schiphol Airport, click here. 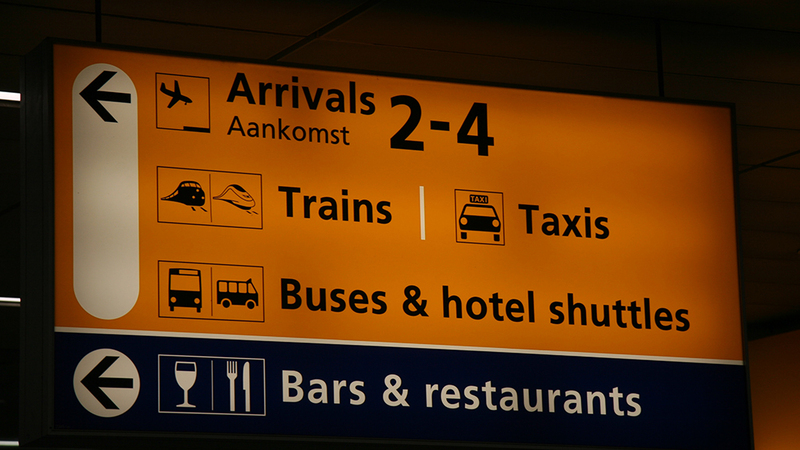 Arrivals at Amsterdam Schiphol Airport, click here. Transfers via Amsterdam Schiphol Airport, click here. Thank you for reading! I hope this article was useful for you and that you are visiting my beautiful country soon. 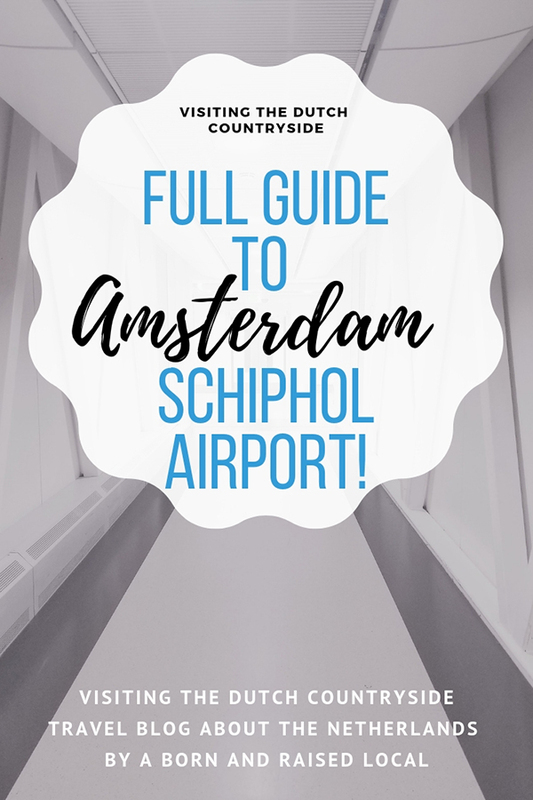 And of course, use this travel guide to Amsterdam Schiphol Airport to guide you through Schiphol. For all my articles have a look here.